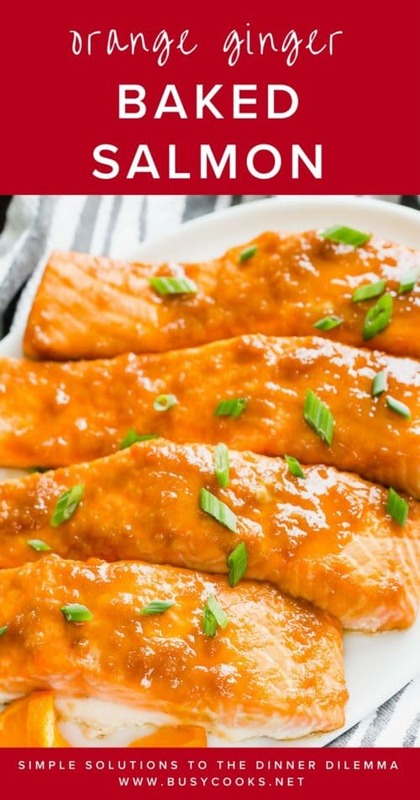 Easy orange ginger glaze gives the baked salmon such a great burst of fresh flavors! 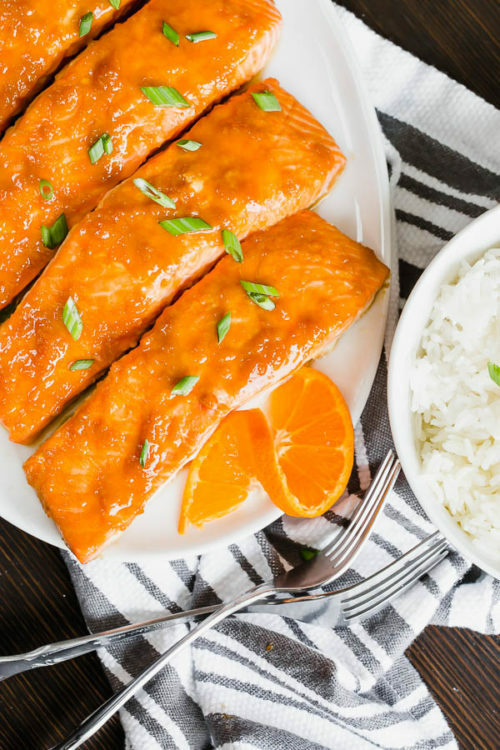 The glaze can be made in advance, but this baked orange ginger salmon dinner can be put together in less than 30 minutes! Opt for skinless salmon filets for this recipe, as the skin will get soggy and unappetizing. Plus, skinless filets bake quicker! To make orange ginger glaze, combine orange juice, soy sauce, ginger and garlic in a small saucepan. Bring it to a boil over medium high heat. And then reduce heat and simmer on medium heat until the mixture is reduced by two thirds, about 10 minutes. To bake salmon, line a baking sheet with aluminum foil for easy cleaning. Drizzle olive oil over the baking sheet and place salmon filets. Season with salt and pepper. Carefully spoon the glaze over salmon filets and bake for about 15 minutes, or until salmon cooked through. Serve with steamed rice and scallions.